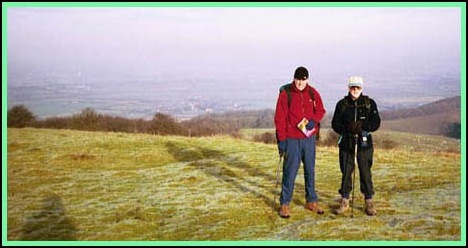 This was almost a perfect walk and one that Larry, Mick and I have agreed we must do on a warmer day and hopefully enjoy the sun beating down on us as we enjoy the views from the top of Bredon. As usual Mick collected Larry and myself and shortly before 9.30 a.m. we were sat having breakfast in a supermarket just off the Evesham By-pass. Larry insisted that we had a "full English" just in case we didn’t find an acceptable pub on our walk. With breakfast inside us it was back into the car taking care not to slide on the car park, which had a treacherous thin glaze of ice across most of it. Mick was suitably informed about the need for care as we "hit" the minor road that would take us to Great Comberton and the start of our walk. Often the worst part of a walk is finding what looks to be a suitable place to leave the car and then to find the start of the walk. Today we were in luck. We found a suitable lay-by in the village – just big enough for a couple of cars – and only a few yards from the track (Russell Street) that went eastwards before it would join up with the track that would take us to the top of Bredon Hill. So it was boots on, rucksacks on and away we went. Although I had a map of the area, Mick was considering buying a GPS so a couple of days before I had put the main points of the route we would follow in my GPS and linked them to form our route. Mick was now using it to see how well he got on with satellite navigation and although I did look at the map a few times during the walk most of the time I left it to Mick to follow the bearings the GPS gave him. However, anyone who has used a GPS will realise that although loading the grid points into it does take time this homework will give you a good knowledge of your walk before you start it. So I had a good idea of the route. Within about half an hour we had started the trudge up the "Hill" and as the bridleway become more broken I got my walking poles out to help with the upward "grind". Although I have in the past received many daft comments about "where’s the snow" or "have you lost your skis", the use of walking poles seems now to be far more acceptable than it was a few years ago. Although most people, including Larry and Mick, only use one I’m very much in favour of two particularly when the terrain gets muddy and steep, which it now was. I also consider that just using one stick can throw your balance out. 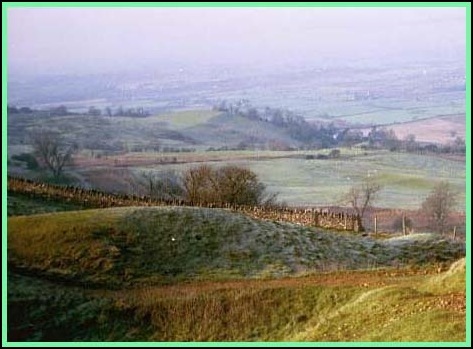 But Bredon is only a little hill and with the help of "sticks" in less than an hour after leaving the car we were all on the top. The views would have been wonderful, but a slight mist hid the detail of the Malvern’s, which we could just see as we looked west. However, the mist did not prevent us seeing the villages of Great and Little Comberton and Elmley Castle below us to the north. For the next half a mile or so we enjoyed these views to our right and the company of a drystone wall to our left. At the end of the drystone wall we came to a gate and having passed through it we came to the field with the earthworks that dominate the top of this part of Bredon Hill. 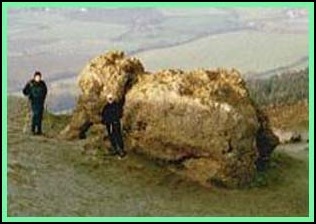 Nearby is also the Banbury Stone, which looks very much like an elephant. However, before we reached this point we saw on the skyline to our left, probably only 100 yards away, the top half of 5 deer, two of them stags. Although we tried to get closer to them they too had seen us and ran some distance away. However, one did come back into closer view moving with a funny bouncing movement until it reached the wall and scrambled over it. Shortly afterwards we stopped by the 18th century tower called Parson’s Folly that is built on one of the walls of the earthworks. Here we had hot drinks from the flasks we carried with us, which were very well received, while we watched a lone female runner come into view from the south. Larry obviously made comments but as ladies may read this I’m being cautious and not repeating them to a wider audience. From here it was a gentle stroll south west until we came to a group of trees which we walked through until "hitting" a path going north which we took to take us off the high ground. With the GPS giving us the general direction we soon passed Woollas Hall and at the nearby crossroads went left and in a few yards crossed the stile on our right. Soon we came to a brook, which we crossed, and from here until we got to the outskirts of Eckington we tramped through mud, lots of it, which added additional weight to our boots. It felt as if I was carry a kilo bag of sugar on both feet. It really was hard work. As my map was only a 1:50,000 it did not show the detail of Eckington but we knew roughly where the church was and usually the pubs are close by so we headed for the place of worship, and we were right. Two pubs very close together so after peering through the windows to ascertain the brew and asking the advice of a local resident we took our trade to the Anchor and it was great. They had a beer called "Piddle in the Wynd", which I was assured by the beer expert Mick as being a very acceptable brew. He was right. In addition Thursdays, and today was Thursday, was their steak day so we all partook of 8 oz rump steak, chips, salad, mushrooms and other trimmings for less than a fiver. It was excellent. We intend to go there again, probably on a Thursday. But it’s December. Days are short and we still have 3 or 4 miles to go. So soon it was boots on (or in my case Sainsbury’s Carrier Bags off my boots), rucksacks on and we are off once more. The next 10 minutes we walked north along the main road out of the village until we met the River Avon. We crossed the bridge and the stile on the right, and walked across pastureland to Birlingham keeping well clear of the cows. Larry likes cow on his plate but he’s not too happy about meeting a fully-grown living model. These did look harmless enough, but you can never tell! It was about here, or maybe a little bit before, that one of us commented on the abundance of mistletoe in the trees. In leafy Warwickshire we don’t seem to get that much but here, in Worcestershire, there was an abundance. Unfortunately it was all quite high in the trees and would have been difficult to get to. This was probably good news for any local attractive females as Larry with a couple of pints inside him and a sprig of mistletoe can be deadly. From Birlingham we took a rutted bridleway which took us towards the River Avon at Nafford. Having crossed a bridge that went over a brook there was a temptation to follow the track that went left through an avenue of trees. However, a quick check on the GPS indicated the route we needed was straight ahead and it wasn’t long before we heard the roar of the Avon as it went over a weir. 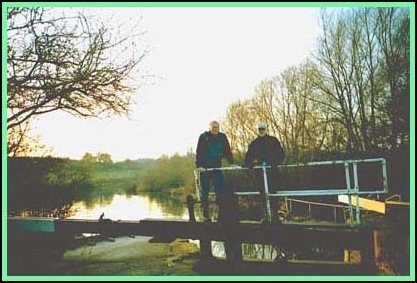 Above the weir was a bridge, which we used to cross the torrent, and soon we were confronted by a swing bridge and adjacent lock, which provided means of navigation for boats around the weir. We would have liked to linger longer here and explore further but with little daylight left we decided to continue. So we left the banks of the Avon and climbed up a bank to the road. From here it was turn left and go along the road until a sharp right hand bend was reached. On the outside of the bend was a footpath which we followed for a mile or so reaching the Great Comberton and Mick’s car just before dusk. It had been a very pleasant walk. Almost perfection. We intend to do it again.